OC Shade Sails has been specializing in design, engineering and construction of Patio Shade Structures, Roll up Sun Shades, Shade Fabric Panels and Shade Enclosures since 1991. OC Shade Sails has been a qualified Shade Sail distributor since 2001. Shade Sails have been installed all over the world and offer a unique and advanced shade concept. 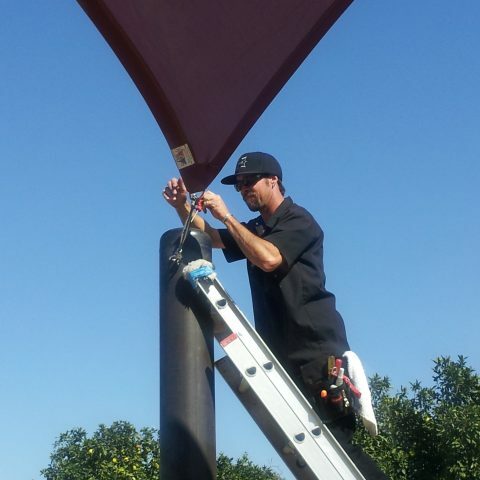 OC Shade Sails operating as DMR Under Tension is a California Licensed Contractor and is fully bonded and insured with an A+ Rating with the Contractors State License Board. The team here at OC Shade Sails consists of qualifying representatives specializing in Engineered Fabric Tension Structures and can provide CAD design drawings, “ROMER” reverse engineering data, CAD material testing, architectural renderings, full fabrication shop consisting of CNC machines and operators, Certified Welders, and an on staff Quality Control Specialists. When it comes to high quality shade sails, no one offers a better value that lasts a long time. Ensure you choose a reputable shade sail contractor! We have the experience, personel and resources to make your shade sail project run smoothly. We can ensure the job is done on time and on budget! We back all our shade sails with the best warranty in the industry. Rest assured that your purchase is covered in case of any defects. OC Shade Sails has spent years in the business. We have already done tons of jobs and we are confident that all our customers recommend and love our services. We see to it that quality always comes first before quantity. We love Orange County and we know all of our local residents really well together with the way of their lives. In terms of your needs on shade sails, keep in mind that we always put you, our customers, first. OC Shade Sails wants to remind you that we do not run our business like your usual big box shade store company. We always make sure that we personalize and prioritize our visit with you for us to evaluate your project ideas and needs properly before we start. How long will shade sails last? All fabrics used in shade sails have a minimum working lifespan of 10 to 15 years. How to ensure good installation? Shade sail’s proper installation basically depends on accurate measurements. If you’ve taken some accurate measurements, you’ll find that shade sails are stretched tight and they don’t sag upon installation. But, the smallest measurement errors may cause shade sails to experience unnecessary wear and tear. How to measure shade sails for installation? Before installing shade sails, it is recommended that you take measurements carefully. You should consider the location where you’ll install shade sails and ensure to measure the things out properly. Other than that, you’ll have to determine the available attachment points during the process. If you did not find any, you will have to erect structures or poles to attach the shade sails.